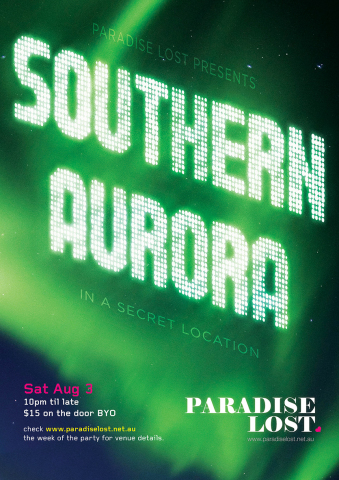 EVENT: Paradise Lost – Warehouse Party – Southern Aurora – This Saturday | deep house, funk, disco | SOUL OF SYDNEY FEEL-GOOD FUNK SOUL DISCO vibes & beyond. Join us this Saturday night as Paradise Lost lights up the night skies for all the star-gazing children of the cosmos. Join us under the Southern Aurora and dance to the light spectacular til the morning comes. Inner-city sounds swirled and whirled by Mr Webster, James Bucknell, Harry Sounds, DJ Manky, JMS and Long John Saliva. Location is up on our website NOW.